Until then, go and doon or āblamboo a pomegranate and let it race through your bloodstream with its delicious anti-oxidants. And oh yes, Dowager Countess Violet Crawley commands me to tell you to have a great week end, whatever that is. I’ll be looking for that pomegranate syrup recipe! 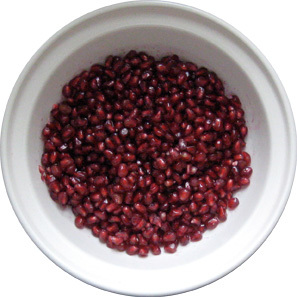 You constantly make me smile with your enthusiasm, especially for pomegranates! 😀 Ha ha. You’ve hit the imagery on the nail. If done carelessly, that would be the scene, precisely! You could publish a book only on pictorial guides of everything!! You should do it my friend.., seriously! Thank you Petit. It’s interesting you say that because my gut instinct was that this was a direction of interest and fun for me and kind of my cup of tea. So, I’m very much taking your feedback to heart. Thank you! Very good idea. Really appreciate it. Please let us know. I would definitely purchase some copies for myself and friends! Loved your post! 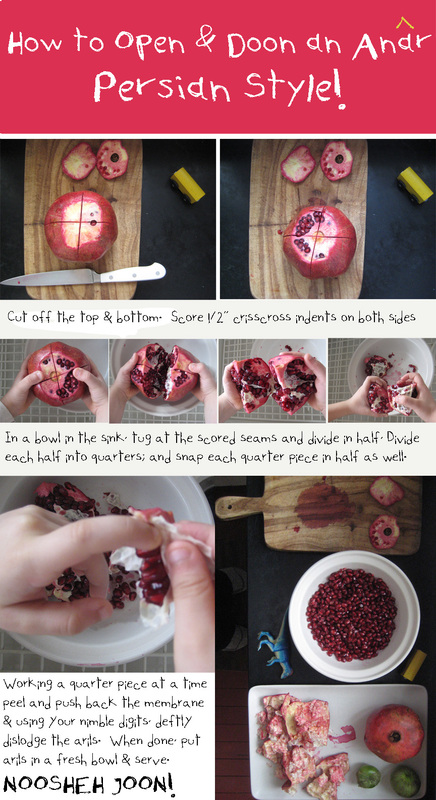 🙂 I’ve also seen instructions (and have tried it) by submerging the pomegranate in a bowl of water. I’ll have to try your technique next time! Thank you! You know, I’ve seen that method promoted recently. I’m all for modern innovations but I’m not sure if it’s an improvement on the tried and true way of doing it the way I grew up with. Then again, haven’t given it a try so I know not wherefore I speak off. It does seem a bit de-trop. Longwinded way of saying: thank you for visiting!! Awesome! Love pom, so healthy. Thank you! Yes it’s not fair that they are so pretty and so good as well! Some fruit have all the luck! Thanks for visiting Natalie. Hi Randy! Thank you SO MUCH for the lovely and complimentary feedback. Do come back and visit all the time! Hi, A handful of posts have been infected by SPAM comments which I totally understand is annoying to receive and it is frustrating on my end as well. I apologize to you and anyone else who’s been getting these unwanted comments. I don’t know if it’s possible to reverse “notify when new comments are added” but I have by now closed comments for any post older than 30 days – which covers this particular post – so that neither you nor anyone else should be receiving any further emails. Dear commenters: If you cicked the “Notify new comments” and no longer wish to get those notification emails, I can not unsubscribe you, but you can do on your end. Look for a “manage subscriptions” link in the footer of each email that you receive, and that will take you where you can “unsubscribe” from that thread. This is according to WordPress’ Support reply to my request for removing readers’ email notification subscriptions. I’m now turning comments back on for this post. free mobile phone from your computer. video but, all those require a connect-in set up).